If you’ve had your fill of Freeport’s busy stores and restaurants, it’s an easy jaunt to Wolfe’s Neck Wood State Park, just minutes away. Here you can grab a trail map at the parking area and wend your way through salt marshes, pine and hemlock forests, and rocky coastlines. Interpretive panels along the way will teach you about the interconnected ecosystems. Birders, or burgeoning birders, will be rewarded here with a special treat: ospreys, also known as sea hawks, nest on nearby Googins Island and often visit the park. When they do, they’ll be hard to miss: they sport dashing black eye bands that give them the look of pirates, and their wings can span more than two meters—wider, perhaps, than you are tall. If you hit the coast at low tide, you can walk the flats, check out the tidepools for signs of life, and watch locals dig for clams. Guided tours are available daily at 2:00 p.m. from mid-July to late August, weather permitting. Pets are allowed, as long as they’re on a leash. 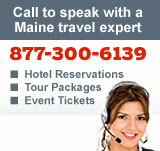 See Maine State Park Day-Use Fees for current admission information. From downtown Freeport, take Bow Street for 2.25 miles, then turn right onto Wolfe’s Neck Road and go another 2.25 miles.